I am sure you have seen photos such as this in various travel magazines. 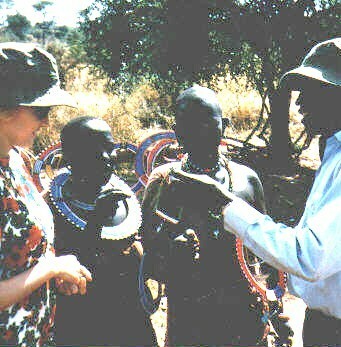 These Masai ladies struck a hard bargain, as our guide insisted we not pay full price - it would be insulting to them. Although I had more "safari-like" attire, by this time in the journey I was reduced to wearing my terry cloth bath shift because we got so hot and sweaty - even though it was the Christmas season.